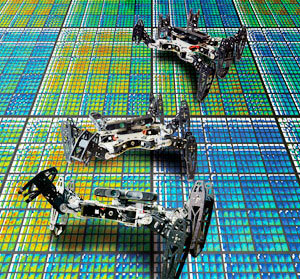 The CNRS Institute for Information Sciences and Technologies (INS2I) supports and coordinates teams and research laboratories working in computer science, control theory, signal and image processing, robotics, and systems-on-chip design. The Institute promotes fundamental research in the above disciplines in close connection with interdisciplinary scientific challenges and major social and economic challenges. INS2I’s objectives are to support and coordinate research in information science, while applying fundamental research to social and economic challenges. The Institute also promotes interactions with other disciplines, especially with mathematical sciences, life sciences, humanities and social sciences and engineering sciences. INS2I ensures the scientific quality and excellence of its laboratories and teams by facilitating the recruitment of top-level researchers as well as the dissemination and sharing of good practice. Aware of the strong societal impact of information science, the Institute develops and strengthens links between its laboratories and socio-economic actors, and establishes direct partnerships with the main players in the digital technology industry. In order to strengthen the development of information science in France, INS2I draws up coordinated strategies with its academic and institutional partners at the regional and national level, via the Information and communication science and technology Alliance (ALLISTENE) in particular. Robots capable of automatically learning to walk again after suffering damage (Institut des systèmes intelligents et robotiques, Paris). artificial intelligence, robotics and human-computer interaction. humanities and social sciences, modeling human cognitive and social processes and behavior, as well as human-computer interaction (including within the context of ambient intelligence), and studying the societal and legal impact of information science. For its own research, INS2I has equipped its laboratories with a large number of software and hardware platforms of national and international reach: computer clusters, sensor networks, vision systems, robots, infrastructures and ‘living labs’ for ambient intelligence, simulation platforms, infrastructures for the synthesis and validation of systems-on-chip, software libraries, etc. the public interest group RENATER, which federates the national telecommunications infrastructures for research and education. INS2I pursues a proactive development policy at the international level with a view to expanding its network of partners and organizing research communities around flagship areas such as big data, decision theory, human-computer interaction, vision systems, control theory and robotics. The Institute is increasing its collaboration with rapidly developing countries such as China, Brazil, India and Singapore, all highly active in the field of information sciences. With joint units in Asia, Latin America and Europe, a joint laboratory in China, research networks in Europe, the US and Brazil, and scientific collaboration programs with numerous countries, INS2I has a strong presence worldwide, reflecting the quality and outward-looking attitude of its research teams. Experimental infrastructure aimed at promoting research in computer grids (Laboratoire lorrain de recherche en informatique et ses applications, Vandœuvre-lès-Nancy).